As many of our regular readers will have noticed, we have been having some technical issues for the past couple of days - seems that scammers are hitting the popular web sites, and preventing access. - Anyway, I see we are up today, so here is the latest news. This photo popped up a couple of days ago, of me at Bear Ridge in 2014 at this time - no snow to be seen anywhere - what a difference in 2018 - likely a couple of feet of the white stuff at this spot. Here are the results of the Vic Brittain National Trial from last weekend in Shropshire UK. Hugo Jervis who finished 5th was also on a TRS for the first time. We have been chatting to a few people lately, about the need to have an “Introduction to Trials” day at some point, similar to what they do at Ioco. - I think this is a very good idea, in order to get new riders out for a fun day, to explain what the sport is all about, without the added pressure of actual competition. - It really is amazing that a lot of people buy Trials bikes without knowing what the real sport is all about. ( No it’s not all about leaping from rock to rock) more on this later. We just got word that our first 2018 Beta Evo factory is on route from Italy, and should arrive in a few weeks. likely around the same time that the TRS Raga beauties get here. - Hopefully some of the snow will have melted by then . Check out this old video of what Trials used to be like ( and are still the same in lots of places in the UK) I have the original video in VHS format. The FIM World Trial GP2 class for 2018, has already got 28 riders signed up ( this is what could be called the support class) plus of course for 2018 the 125cc class gets official status. - What kind of surprises me is where do these guys get the money from? and how many will actually compete in the events that are in distant locations ( like Japan etc). This is a pic of Bob McGregor, at the 1939 Scottish Six Days Trial which he won - He is the only Scotsman to ever win the event. ( He won twice) pic courtesy Trial Guru. Dave Chambers. lives way up high on the same Mountain and posted this pic of his driveway. Weekend News - Graeme Jarvis won the “Tough One” held near my old stomping grounds on the Welsh border. while Travis Teasdale finished 2nd on a Beta and David Knight 3rd on the Gasser. Footnote: We are experiencing some.technical difficulties with the Interenet, that is why the blog is late today. Well, - It’s the last weekend of January, and a very wintery one for sure !! It has hardly stopped snowing in Vernon, and looking through the window this morning, I see it is the same story. - I think the West Coast is also getting hammered with bad weather, lots of rain & snow, so not sure if Sammy went ahead with his Trials Training session or not. Of course, A lot of people like the snow, and get out Skiing, snowmobiling and the new craze - snow-biking - The X Games went this past weekend which included Snow-bike racing, and it was Calgary rider Cody Matechuk who took the gold. - Hot favorite Ryan Villipoto, crashed out in his heat race and didn’t qualify for the final. Here is a pic of Dovi on the Ducati. Still on the road race topic, here is a pic from 1985, it shows old friends Steve Crevier, and John Palmer on the bikes, along with ace tuner Bryan Rolls. The Scottish ones are my favorites and I have a ton of these, plus World Rounds, both Indoor and Outdoor. Well we are not going to post anything on the so called X Trial from France as it was a complete joke with the new rules. - Toni won - that’s enough said. UPDATE: This is what Jordi posted. Got a call from Stan yesterday -temperature in Mexico was around 70 plus on the beach !! We chatted about the pic I posted of his Trick Trials Team from the 80’s - Yes he said, it sure was run on a shoe-string budget. - He also told me that it was Harlow Rankin who took the photo of him doing the flick off the half-pipe - just a short time after he had finished building it ( paint was still wet) - It seems HR did all the printing for Stan’s Promotions, in return for a bottle of Scotch. !! We also talked about the need to promote the sport of Trials for the “Average” rider - with long loops and easier natural sections, but of course the current state of Government intervention ( fueled by the US Environmental movement) in Alberta, will make this difficult. Dean Wandler posted this pic of a gear bag we supplied him with to go to the TDN back in 1998 - He says it is still like new. - We still make our Tool belts and gear bags, backpacks etc, in the Valley, all hand made and very labor intensive, however we only make these to order these days, as there is very little money in this business. ( We can also silkscreen your name) - Give us a call if you are interested. A peek out the window, tells us that this will be another weekend watching the box - but at least we are starting to feel better. If you checked the blog early yesterday - take a minute to scroll back, and click onto the Albert Cabestany video - it really does show how good, both he and the Beta really work in slick conditions. Meanwhile, here is a great shot of Tommi Ahvala at the Quebec World Round a few years ago. And still on the Quebec theme - The ATAQ have just posted their Calendar for 2018, which includes the WTC National Championship (East), in September. While some folk will remember that yesterday was “Robbi Burns” day - I wonder how many will know that it’s Australia Day - today, and to celebrate Silver Star Mountain will hold their “Bikini” Ski day - should be fun for the younger set. 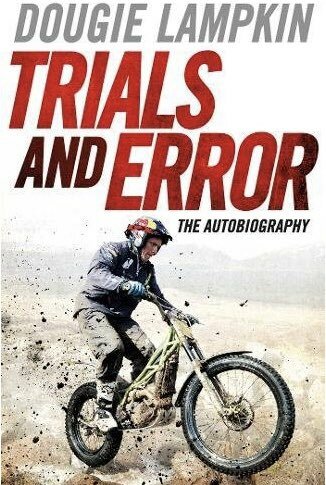 When I was a teenager, wanting to learn all about motorcycle trials, there was only one book available - by a guy named Max King ( no relation to Sammy) - I must have read this dozens of times, studying the black & white photographs, trying to digest everything. - The new riders these days, are much luckier, as there are hundreds of videos available, plus a ton of books. - Here are some of the better ones. Check out this video of Albert Cabestany practicing a very wet slippery section on the Beta -the traction of the Italian bike even surprised him. A number of people have contacted us regarding Sam King’s accident, but we can only tell you what we have seen on Facebook , which is that he has a Trials school this weekend scheduled at Ioco, then he flies to Australia on Monday for a month. Like they say, no news is good news. We are still in the icy grip of winter, with another dump of snow yesterday, with more in the forecast. But take a look at this pic of Pete & Zoe Bustin’s front porch !!! now that is a lot of snow for the lads to clear at Ymir. BC. - Just as well nobody was underneath when it all came off the roof. The latest issue of Trial Mag: UK will hit the news-stands soon, and will include a test of the new TRS 300, now going into it’s 3rd year. - As the Dealer of this brand for Central BC and Alberta, we can report that the bike has proven to be not only very reliable, but at the top edge of the results sheets, all over the globe. - The parts supply when needed - is as always, next day service from Vancouver ( Mountain Motorcycle) - However we should mention that we have yet to sell a rear fender for any of these bikes ( Not even Sam has broken one) Some of which have lots of miles on them - The very first 2016 TRS 300 went to a customer in Northern BC, who is known for being fairly hard on his bikes - suffice to say that so far he has not needed to order ANY parts. The French city of Strasbourg will this Friday host the FIM X-Trial World Championship which arrives at its halfway point with Toni Bou firmly in command. It is the first time that the city of the European parliament has held a world championship indoor trial event. The capital of the Alsace region plays host for the first time to a trial competition in the X-Trial World Championship, with no less than the participation of Repsol Honda Team’s multi-time champion Toni Bou. The fourth date in the calendar will take place at the Zénith Europe centre in Strasbourg this Friday evening at 20:00 hrs. Fans can look forward to a qualifying round, followed by the semi-finals and the subsequent final, with the winner’s podium scheduled for 23:00. Toni Bou, after winning the three previous races (Vendée, Montpellier and Toulouse) has a substantial advantage at the head of the X-Trial Championship overall standings, some eighteen points clear of main rival Adam Raga. The Strasbourg event is the final round of the string of events in French cities, with the championship now moving on to Spain for the next two stops (Barcelona and Seville) before the championship closes with dates in Paris and Budapest. We have just heard that Sam King and Danielle had an accident on route from Vancouver yesterday, and while they are both OK, the Pickup is a write off. more details when we know more. More snow yesterday, and still more to come through the week - but it is after all, still very much winter out there, and at least I don’t have any Doctor visits today !! Here is another pic by Jamie McGregor, showing Stan’s poster from back in the 80’s. - There is no doubt that Stan was at the very fore-front when it came to doing Trials Stunt shows. Cecile Gambin took this great shot of young Brandon Schmidt at Ioco which is on the cover of the new emag. At a time when Land use is high on the agenda in both Alberta and BC, it’s great to see that the Ioco area is still available for Trials use by the CPTA, However, as we know only too well, things can change with the stroke of a pen ( Westwood Road Race Track) - So we hope everybody appreciates all the efforts taken by the club to keep this fantastic location open. Laia Sanz has been treated like a Movie Star after her recent 12th place finish at the Dakar Rally . This is a nice shot from the 1972 Scottish Six Days Trial ( We were at that one) It shows Mick Andrews on route to another win on the Ossa, his last before signing for Yamaha. - The famous rocky section is Laggan Locks. The inset shows the Ducham’s Oil sign in the background, which was quite popular back then - we tried some of it for a short time. It’s hard to believe that in only a short three months time, the 2018 Scottish will be underway, and after last year’s fantastic weather, no doubt many lucky entrants are hoping for the same again. - The popularity of the Scottish appears to be going from strength to strength, with 500 riders applying this year, in the hope that they will be lucky in the “Ballot” which only allows for a total of 300 starters. We have mentioned before that Vintage or Classic events, have seen a boom in recent years in both the UK and Europe ( possibly because of the new circus like sections at many modern events) - Here is a poster for an upcoming one, where some of the Stars from yesteryear will be attending. The Moto GP Teams head to Sepang this week, for early season testing, which starts Sunday - after the fantastic racing in 2017 it’s hard to think it could be any better this year. Well, the last of the Canadian Motorcycle Shows has wrapped up in Vancouver for another year, and it will be interesting to read up on overall impressions and gate numbers - Are the shows getting better? or worse? It would seem, that long distance touring Off Road - is getting more attention and here is is one booth at the Tradex show promoting that aspect. Yesterday, I mentioned about posting more junior pics to promote our sport, so here is one from Saskatchewan taken by Derek Thomas on a rare January day out with the kids. So this morning, I will head into town for the first time in over a week, after my bout with the Flu - another visit to the Doc, this time to discuss the latest scan on my knee - hopefully we can sort something out on this, although the immediate fix for 2018, will be to revert back to riding my Beta Evo 200, with the easy to start left kicker. We have heard from the ATAQ club in Quebec, who once again plan on hosting the Eastern Rounds of the WTC National Championship, which will take place on the September 16th weekend. Ryan Villopoto signing with Yamaha as a brand-ambassador came as a shock to many. Despite racing Yamaha’s as an amateur, to the masses, RV is a Kawasaki guy. It seems however that his new signing has lit a fire in Villopoto – or maybe it’s financial reward of seeing a blue fender when he rides. Whatever it may be, RV is riding and looks to be seriously enjoying his riding, in a recent interview with Racer X Online, Ryan admitted a signing to Yamaha before retiring may have extended his career. So will we see RV2 race again? It appears so! Ryan has been loaded some videos on social media testing a YZ450F snow bike, with asperations of racing X-Games in Aspen. We’d love to see Ryan compete in more one-off races in 2018. How about Aus-X Open again RV? The weather improved a bit on Saturday for the Vancouver area, and made life easier for Sam and his Ride the Vibe crew at the Tradex Motorcycle show. Here he is doing his back-flip on the Outlaw TRRS 300. - Looks to be a good crowd of spectators. The 2018 Dakar Rally is now in the history books, and will list it as one of the toughest yet - lots of crashes, but fortunately none that were life threatening. - I spite of strong challenges from other factories, it was one again KTM that came away with the bike victory. German rider Matthias Walkner was the man who conquered the dunes and mountains of South America, when others faltered. Toby Price from Australia rode hard, and did well to finish 3rd overall after returning from injury. As we look ahead to the 2018 Trials season, it’s also fair to glance back at what transpired last year, and in the previous decades in Canada. - While many people tend to think that our sport is growing, this is only partly true, as it appears that for every area that shows growth, another one slumps, in both bike sales and attendance. Generally speaking, it was the weather related issues that affected both sales and events last year in Western Canada, the forest fires had things shut down in BC at a prime time during the summer season. This could be, because the clubs put a lot of effort into catering to the lower classes, making events more attractive to people who just want to get out for a Sunday ride without having to resort to gymnastics. Looking back at the early World rounds in Canada, the bulk of the entrees were all from the home market, where as these days, the sport is completely different at this level. - There hasn’t been a World Round in this Country for many years. How things progress in the future, will I think depend on a lot of things, but in my opinion, all organizers, need to study carefully how they both promote and set up events, in order to succeed. - Somebody once said, that you don’t set up a Trial for the winner in the Expert class - this could be even more true today. The gulf between the 2-3 top riders and the rest is vast. - It could be said that at many events, the difference in ability, tends to split the entry into two or three different Trials. Here is a list of some of the events on the Calendar for 2018. If you wish to learn more about Trials in Canada, we suggest you click onto the Trials Canada website. Bob has compiled a great list of results from past events, plus posted info on the WTC. You are currently browsing the outlawtrials.com weblog archives for January, 2018.